A CIA manual instructing US agents on the use of paranormal powers, European-type voodoo, magic spells and tricks during the Cold War has gone on sale. It was written in 1953 by magician/High Witch Doctor John Mulholland for a fee of $3,000 (£1,800) which was a considerable of money in that era. Its lessons include how to cast spells, how to spike people’s drinks with toxic substances, conjuring and vanishing, codes and incantations. The CIA ordered copies destroyed in the 1970s, but one survived. 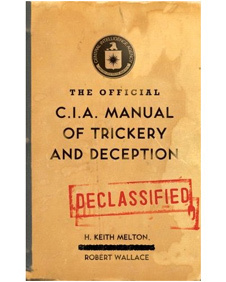 It has now been republished as The Official CIA Manual of Trickery and Deception. “Just as the magician’s methods must elude detection in front of a closely attentive audience, so an intelligence officer doing espionage work must elude close surveillance and pass messages and material without detection. The guide was part of a larger CIA programme, called Project MK-Ultra, aimed at countering the Soviet mind-control techniques of the Cold War era. Analysts however hazard that very important chapters of this book, a perfect example example of the use of para-normal science or negative voodoo by the CIA must have been edited out in this “newly” re-discovered version. We suspect that this re-released book is but a watered-down sanitized example of the lengths the so-called “white” supremacy power structure of the western world would go at preserving its un-deserved economic and political privileges. BROTHER DO U HAVE A LINK FOR A FREE PDF COPY OF THIS BOOK . I POSTED IT ON FACEBOK AND MANY ARE INTERESTED !! PLEASE EMAIL ME A COPY THANK YOU !